us.archive.ubuntu.com must have been undergoing maintenance. Here is another screen shot of the mtr us.archive.ubuntu.com command. Why does us.archive.ubuntu.com reside in London? 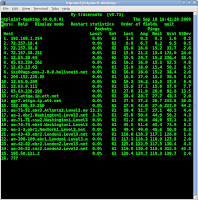 Below is the output from mtr us.archive.ubuntu.com command. I was trying run updates on my Ubuntu boxes and was receiving some timeouts. I start investigating with the mtr command. Does us.archive.ubuntu.com actually reside in London or are there servers in the US undergoing maintenance?